Roger W. Bush was the Founding Program Director of the Billings Clinic Internal Medicine Residency and is certified in Internal Medicine with a Focused Practice in Hospital Medicine. He grew up in northeastern Montana and currently lives in Seattle,Washington. Dr. Bush serves on the ABIM Board of Directors and the Internal Medicine Board, which oversees the program and products for the Internal Medicine certificate. I like stories. Patients need to tell their stories and hear them retold in privacy. That rolling human narrative fulfills and sustains me. There are two meaningful moments that come to mind for me: when I read for the NAMES Project Foundation and when I served as a physician for an Honor Flight. I finished medical training in 1983. Between 1985 and 1997, before there was meaningful medication, I spent several tough years treating people with AIDS. In 1990, the AIDS Quilts came to Seattle and I read the names of folks who had died in my care for the NAMES Project Foundation. I was able to honor them in their suffering and it was a bittersweet moment. In October 2013, I served as the physician for a Montana WWII veteran’s “Honor Flight” to the World War II Memorial in Washington, DC. Often, these veterans have not shared their stories with family and friends. I was amazed to see that when a 737 flight full of veterans traveled together, they were able to share their stories with each other during an emotional and meaningful weekend. It was an honor to care for them because they gave so much for us. When you talk about the work you do, what story do you like to tell? I like to share about the support and encouragement I have experienced—from outside the profession—for rural primary care and new graduate medical education programs to address specialty and geographic maldistribution. It’s been the politicians and business people, the Farmers Bureau, and the Lions Club that have really helped support the need for medical doctors in rural areas because they value what doctors do. It’s heartwarming to see their generosity and the way they understand that good healthcare really is a part of a great community. One of the biggest misconceptions is that we doctors don’t reliably engage in safety and quality improvement, or appreciate the complexity of our patient’s context. I believe that is because we are acculturated to the belief that mastery is achievable, durable and transportable. “All teach, all learn, all improve” is a stretch goal, but it’s where we need to be. It’s a challenge to make time to serve others while making a living. However, the best thing about serving is having the opportunity to diminish some of the frustration and dissatisfaction that I and others feel in our careers. We have frustration over technology and insurance companies and organizations that get in the way with too many rules. 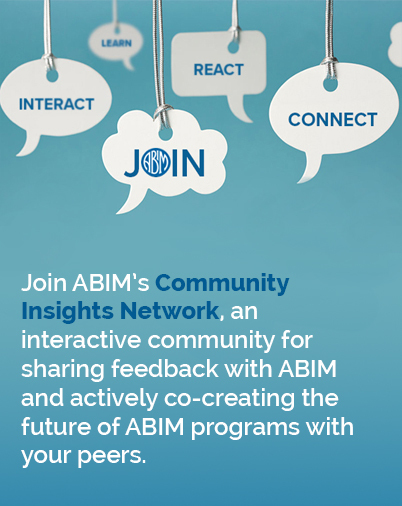 We can either complain or be part of the change and as a governance member, I want to help make ABIM better. I want my colleagues to be able to say ABIM helped me to be a better doctor. If we become better doctors, less people will suffer unnecessarily. I want to work to make the exam less burdensome and help make healthcare more accessible, affordable, safe and reliable. I’d encourage others to join ABIM governance because I’ve personally loved learning from smart, informed, committed and generous learners. Aside from medicine, I am interested in stories, family, dogs, sailing, eating well – and I also bake a wicked fruit pie.